Exotic materials: love them or hate them? And where are you in regard to plastics, which are ever-increasingly appearing in wristwatch cases and movements? Plastics are a broad category of polymers so first things first: what are polymers? Polymers are large molecules consisting of smaller repeating units of molecule compounds that create a chain with no defined size or shape. Polymer chains, which could theoretically be infinitely long and still be considered one polymer molecule, are made of numerous repeating monomers. These are molecules that have the ability to bind with other molecules to form supramolecular polymers (“poly” = many, “mer” = part). Polymer molecules have a large variety of properties depending on the type of monomers they consist of and the organization of the polymer chain. The molecules have the unique property of large molecular mass relative to the small molecular compounds, allowing for physical properties such as toughness, viscoelasticity, and a tendency to form glasses and semi-crystalline structures rather than crystals. Basically, thanks to how polymers form they can perform molecular magic compared to many more traditional materials like metal, stone, mineral glass, or sapphire crystal. The variety of polymers is what makes them so useful, and given the vast physical properties of the many types of polymers it is guaranteed that they would make their way into the technological marvels that are wristwatches. Of course, they have found homes in ways that are both expected and unexpected. The main types of polymers are thermoset and thermoplastic, among which we find natural or synthetic resin, amorphous and crystalline plastics, and rubbers. Of course I don’t need to delve into too much detail about how rubber has played a crucial role in the history of watchmaking (gaskets, o-rings, and straps are everywhere), so let’s focus on the main types to understand what they are and how they might be used. Thermosetting polymers undergo a chemical reaction at an elevated temperature causing a permanent transition to a rigid material. Sometimes the process is initiated simply with the addition of heat or pressure and sometimes with the addition of a catalyzer. Thermosetting polymers cannot be re-melted to be re-used (except as filler), instead once molded they are generally fixed. Thermosetting polymers include rubbers, resins, and, of course, thermoset plastics. Each type has a specific use, and when it comes to watches these are critical to understand. Thermoset plastics and resins tend to be hard and rigid, resist deformation, and don’t sag when applied to heat. They are extremely useful when an inexpensive, durable, light material and easily formed material is desired. This is why millions of plastic components around the world are made with molded thermoset plastics. For even more strength, fibers or fillers can be added to increase resistance to torsion and flex and add overall geometric stability. Reinforced thermoset plastics and resins make up some of the strongest polymers, creating the entire material class of reinforced polymer composites. Reinforced polymer composites are one of the main plastics in watches these days. That is because, thanks to glass, carbon, graphene and other materials, some very strong yet very light composites can be made. Carbon fiber and forged carbon cases, for example, are polymer composites. All of the Richard Mille cases that feature TPT, NTPT, Graphene TPT, and even the carbon nanotube-reinforced composite of the RM 59-01 Tourbillon Yohan Blake fall into this category. Any watch brand creating cases, dials, or other components (like the carbon movement bridges of the Roger Dubuis Excalibur Carbon Spider) out of reinforced composites are featuring plastic components. The carbon fibers, graphene, or carbon nanotubes are held together with a polymer resin, which makes for an intensely strong material thanks to the interplay between the fillers and the resin structure. Straight resin materials, most popularly Bakelite, were predecessors to today’s composites. In the mid-twentieth century, many manufacturers used Bakelite (a thermosetting phenol formaldehyde resin) as bracelets, and a majority of the major dive watches featured Bakelite bezels. Rolex, Omega, Blancpain, and many more used Bakelite because of its lightness, toughness, and resistance to deformation and abrasion. Of course Bakelite and most resin materials, including reinforced composites, can be scratched and damaged. This means that the forged carbon watchcases are susceptible to damage just like any other material softer than titanium or ceramic. On the other hand, reinforced composites have the ability to rebound from dings and bumps better than hard metals, and so while a steel case might get a ding from a door jam, the composite case might fare better simply because it is light and pliable enough to simply bounce off. These properties introduce weak spots too, though, and require consideration of the intended use, just like any material choice. Thermoplastic polymers are what most people think of when they think of plastic: a softer polymer material that can be heated and formed repeatedly due to the material’s ability to enter a glass transition well below the material’s actual melting point. This is where the magic happens: a glass transition temperature is a temperature at which an amorphous material (like a polymer) becomes a viscous, rubbery, liquid-like state. This happens mainly to amorphous plastics and silica (glass) and has become a very useful physical change that humans have exploited for millennia. Ever since the discovery and widespread use of amorphous polymers, the practicality of a glass transition has become even more useful across the entire industrial and manufacturing world. Many types of polymers are thermoplastics, including acrylic, ABS, nylon, PLA, polycarbonate (Lexan), polyetherether ketone (PEEK), polyethylene (PE, HDPE), polypropylene, polystyrene, poly(methyl methacrylate) (PMMA, Plexiglass acrylic), PVC, and Teflon (PTFE). Even disregarding the less common ones I didn’t mention, these materials account for millions upon millions of plastic components that make up our world and everything we use. Of course, they have also played a large role in the watch world as well. The flexibility, moldability, low friction, strength, transparency, opaqueness, and colorable attributes of these plastics are useful in so many ways. Historically, before widely available synthetic sapphire and even now, brands have chosen to use acrylic or polycarbonate to create watch crystals as they were easy and cheap to manufacture, provided improved shatter resistance compared to earlier glass, and could be made easily in unique shapes for the ever-expanding designs of watches. Even though these plastics could be scratched, they could also be easily polished again. And if they were damaged beyond repair, replacement was cheap and easy. When the so-called quartz crisis began, watches were being sold that were now made entirely out of molded thermoplastics, usually with quartz movements featuring either thermoset or thermoplastic components. This led to Switzerland’s response of the Swatch watch, which followed suit and created thousands of easily produced, inexpensive plastic watches with plastic or silicone (a thermosetting polymer) straps. To this day, Swatch creates millions of these types of watches to compete with the most basic of quartz watches. Seiko, as a bridge between the low and high end, produces mechanical movements that feature plastic components. Specifically, date disks and corresponding wheels and correctors can, depending on the movement, be entirely plastic. This keeps cost and weight down, and in some cases increases the longevity of the watch. With thermoplastics, the material can be pushed and bent without breaking, possibly still returning to nearly their original shape, or at the very least resist bending if a little too much force is introduced. This is actually very useful for the gear train in a watch movement as it’s a mechanism interacted with by the user every time the watch is wound. Plastics are also useful in the date setting mechanism as wearers commonly attempt to change the date while the date is changing, which can damage the components. But thermoplastic components can be a little bit more forgiving, even providing a haptic feedback alerting the person adjusting the watch that they are applying too much force. But if you think that only the lower-end watches feature plastic components, you’d be wrong. Plastic date disks are common at many price levels, especially if the movements used are ETA. Even so, some watches contain plastics for things like date, month, or day disks simply because the weight can be kept so low (due to the density of the material) that the required energy for calendar mechanisms is reduced, improving the overall power reserve and chronometric performance. Some brands still make these components from brass or other stronger materials, but those are usually in movements developed and produced with specific requirements in mind. But perhaps the best example of a high-end watch company seeing the benefit of plastics is Rolex. It is generally common knowledge that Rolex uses Teflon-coated (not solid Teflon, but coated metal) wheels in the automatic winding mechanisms, largely because Teflon (PTFE) has one of the lowest coefficient of frictions of any solid. This means that the mechanism is very low friction, yet strong, and requires no lubrication. Since automatic winding mechanisms are always moving but aren’t required to maintain the precision of a going train, this is the smartest place to use a plastic material. It utilizes the special characteristics of the low-friction Teflon but doesn’t rely on the material for chronometric performance. Plastics used in the future! Moving forward, plastics may end up being used even more as composites technology advances and 3D printing becomes more accurate and faster. In watch development, 3D printing is usually only used (at least polymer 3D printing) for prototyping cases, dials, buckles, and even straps. The accuracy of the machines it usually good enough to print a case that a movement will fit into, but not good enough to print tiny components that will be geometrically accurate. So for now in horology, printing is primarily a development tool. Of course, if parts are printed on a larger scale, then mechanisms and entire movements can be printed to test rough functions. The smaller prints are even becoming a thing, at least among independent developers without the budgets or capabilities of established companies. Barrelhand, a new company out of San Francisco, has been publicly developing its first watch with an interesting mechanical dial and the prototypes are an amalgamation of 3D-printed plastic components and genuine metal pieces. The design is pretty cool, and the process shows that complex movement development is totally possible on a budget – and with plastic. Larger brands also dabble with plastics for development, but since they also usually have production facilities, the parts can be manufactured in metal on CNC mills and lathes and usually out of quick-to-cut aluminum. But plastics have their place, and as companies continue utilizing space-age composites, we will start seeing more implementation of polymers in all levels of watchmaking. Take carbon fiber and forged carbon: once the realm of uber-expensive watches, but thanks to brands like Gorilla Watches and a variety of micro brands, carbon cases can now be had for under $1,000 regularly (see The Gorilla Fastback Collection: Extended Review & Something New). And that is typical of materials development. When plastics first came on the scene, they were exotic replacements for traditional materials. But as technologies improve, and economies of scale kick in, it becomes available for everyone. That is also why in haute horlogerie, there is so much emphasis placed on tradition: tradition won’t be cheaper five years down the line, and it won’t be on everybody’s wrist. But there are those who realize materials are what they are, and if one is better for a particular task, then it is silly not to use it. Consider the G-Shock from Casio: it has been made in hundreds of variations over the years, but the most successful is still the completely plastic, nearly bulletproof version because it is inexpensive to buy and beats nearly every other watch in durability. 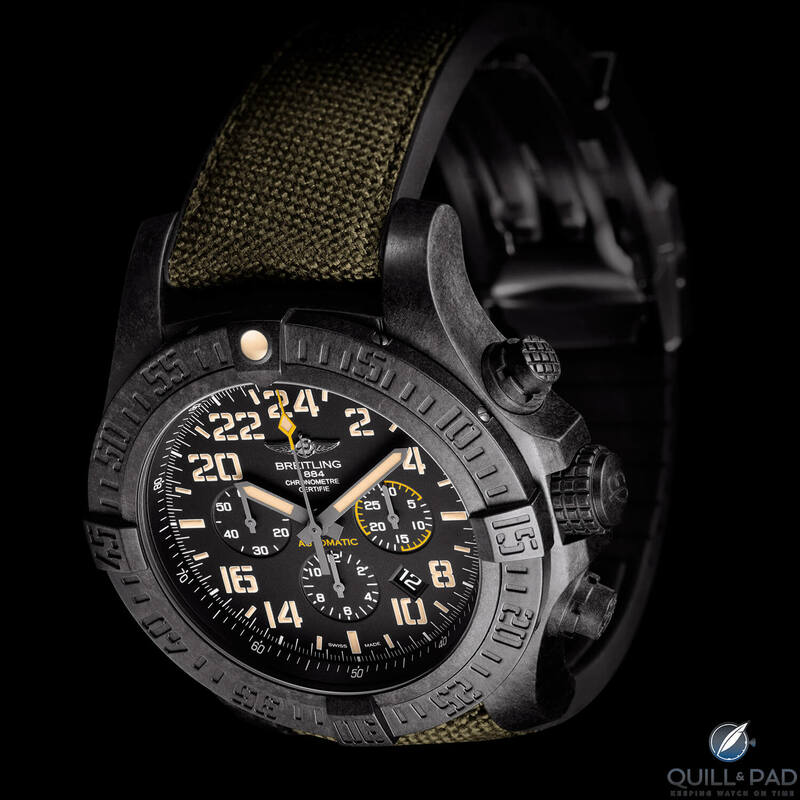 Companies like Breitling have paid attention, creating watches (like the Avenger Hurricane) that are made from strong, lightweight, and durable plastic composites because that is what a truly versatile tactical watch needs to be. But, like anything, metals still have their place, and plastics can’t compete in a lot of ways. There will always be arguments about how plastic can’t be a luxury material, usually from people that buy gold and platinum watches. But people that buy Richard Mille watches made from composites for hundreds of thousands of dollars obviously disagree, seeing the value in ultimate lightness and strength. And since Richard Mille recently debuted the RM 50-03 McLaren F1 featuring a tourbillon split-second chronograph encased in grapheme-filled composite weighing in at just 38 grams and able to withstand shock loads of 5,000 Gs, it seems clear that plastics have more than a fighting chance. There are likely many more instances of polymers being utilized in the watch industry in various ways, but this is intended as a primer on just what, exactly, plastics are and how they can be used. Please feel free to continue the story in the comments below! Plastics definitely have a future in watchmaking. Especially when it comes to making functional watches. Lightweight, doesn’t conduct heat (which is great in arctic climate), and cheap. I think Swatch got it right on the price for a plastic watch. Some of the other watch companies…..not so much. Great article, very interesting. I just have a real basic question. How much of this is going to be on the quiz? Seriously, it is truly amazing how far this industry has and is going in terms of finding and developing new materials with which to build watches. My concern is that all this R&D cost is going to push the average collector, like myself, out of the equation due to the increase in the cost of the watches being built. Thanks, and keep the good work coming. Well, though scientifically speaking, a polymer is essentially a plastic in material composition but let us be a little more poetic and say porous alimunum alloy filled with a super light polymer (Zenith) or a polymer set with carbon nanotubes (Richard Mille). That is merely something of my opinion. I think polymers represent the same philosophy as , say, carbon fiber. We are looking for lightness. Or synthetic diamond (Greubel Forsey) like silicon has the goal of improving rate accuracy while being completely resistant to magnetism or temperature variations. Watchmaking is getting more scientific every day and with the intense spirit of innovation for many companies today, I think plastics, silicon, and whatever else is to come certainly has a future in watchmaking and can only get better and better with years to come. Amazing article.